Combine all ingredients in a slow cooker and toss until the beef is evenly coated. Cook on low for 8 hours. Remove the beef from the liquid with a slotted spoon, and shred with two forks. Add the shredded beef back in to the liquid. Let it sit in the liquid for an additional 10 or so minutes. Warm tostada shells in the oven on 375 for a few minutes until they're shiny. This will crisp them back up if they've gone a little stale. Meanwhile microwave the refried beans until warm and spreadable, about 1 minute. 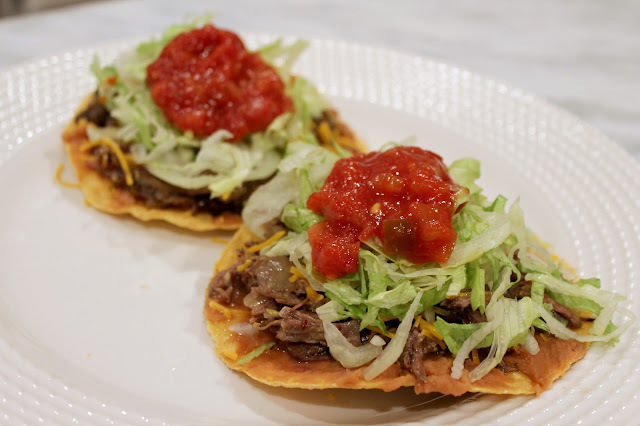 Spread 1 Tbsp of beans on each tostada. Top with shredded beef, cheese, lettuce, salsa, and sour cream.